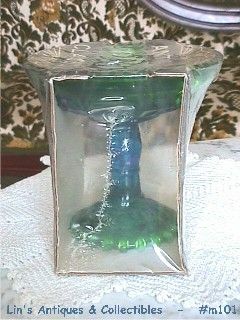 This listing has a glass compote made by Jeannette Glass Company -- it is in the original package that has never been opened! Package is marked on top: Antique Classics. Side is marked: Compote/1324, Hand Wash Only. Bottom is marked: The Jeannette Glass Co., Jeanette, Pennsylvania. The compote measures 5 1/2" tall, 6" diameter, and is a beautiful green bowl shading to blue with blue stem shading to a green base.